* in December, 2010 I was diagnosed with Stage 2 breast cancer which created the opportunity for me to truly receive the gift of my music for myself. Visit, My Cancer Journey for more info. * in December 2012 I was re-diagnosed with breast cancer, underwent more surgeries and completed my book, "Loving Life...all of it - A Walk with Cancer Compassion and Consciousness." * my purpose-filled and magical life with my husband John continues to inspire everything I create as a result of our spiritual journey with The ORIGINS Process...his gift to manifest and share with the world. So there you have it...a brief synopsis of how my life has divinely come to this point in time. Thanks for visiting and have an awesome day!! 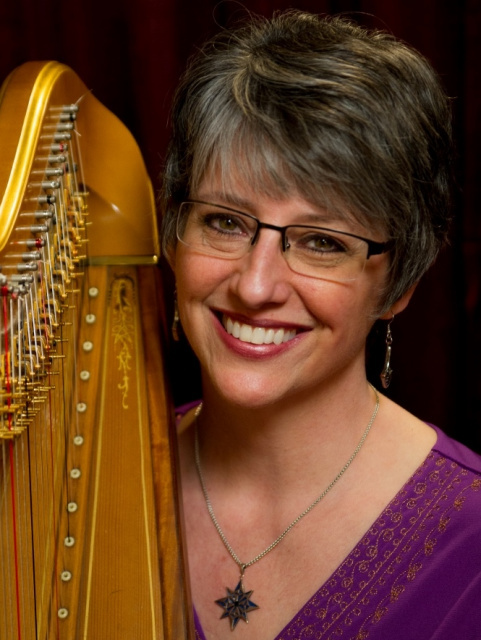 Amy Camie is a spiritual harpist, award winning performer, inspirational speaker, recording artist, composer, author of “Loving Life…all of it – A Walk with Cancer, Compassion and Consciousness” and Founder of the Scientific Arts Foundation. She has presented hundreds of seminars and workshops for local, regional and national audiences on the power of sound, music and conscious self-care, and is a contributing author to two international books, “The Spiritual Significance of Music” and “LOVE LIVE FORGIVE.” Her solo harp CDs have been used in several pilot research studies indicating how they increase neurological functioning, support the immune system and reduce pain, distress and anxiety levels. Amy's CDs are used throughout the world in hospitals, cancer centers, hospices, and nursing homes as well as for general relaxation and stress reduction. Amy Camie is a professional harpist, inspirational speaker, recording artist, composer, author, and Spiritual Initiator of The ORIGIN Methodology of Self-Discovery. She has presented hundreds of workshops and presentations for local, regional and national audiences on the power of music, resonance and conscious self-care. Amy’s music calms the mind, relaxes the body and gently touches the soul. As one woman said,"You touch others in such a deep place with your music because it comes from such a deep place inside of you"
Amy Camie is a spiritual harpist, passionate speaker, recording artist, composer, inspirational writer and Co-Initiator of The ORIGIN Methodology of Self-Discovery. Her strong classical background allows the music from her soul to flow freely through her fingertips creating highways of sound that awaken memories of wholeness, harmony, compassion and love.